WASHINGTON – The family activity may have shifted from church-going to shopping, and the food could be Cajun instead of traditional turkey, but for many the spirit of Thanksgiving remains the same as that immortalized by Norman Rockwell in 1943. 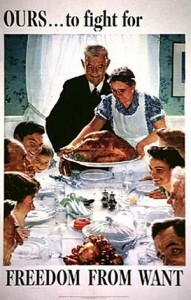 Rockwell’s “Freedom from Want” depicted several generations of a white American family crowded around a formal dining table, where the aproned matriarch is setting a large turkey while the patriarch, in tie and jacket, looks on. Norman Rockwell’s 1943 painting, “Freedom from Want,” was one of the pieces in his Four Freedoms series. It has since become synonymous with traditional American Thanksgiving celebration. A Public Insight Network query for Cronkite News that asked Arizonans how they celebrate the holiday brought responses ranging from Rockwellian to radical. For Wilson, choosing a theme for Thanksgiving is as important a tradition as any other. For Arizona resident Michael Kinnaird, this year will be about re-establishing a holiday tradition. “I have had my traditions broken and the families that I shared them with disowned me,” Kinnaird said in response to the PIN query. But this year, he is looking forward to spending Thanksgiving with his ex-wife and daughter for the first time in three years. There are other modern holiday traditions that would have been alien to Rockwell. The National Retail Federation said this month that “133.7 million holiday shoppers were in stores and online” over last Thanksgiving weekend, and that 135.8 million “definitely will or may” shop over the coming weekend. Jan Allen, a Butterball Turkey Talk-line expert, said the emergence of Thanksgiving as the start of the holiday shopping season has somewhat disrupted the holiday’s family spirit. Arizona resident Richard Morris told the PIN bureau he will celebrate with friends feasting on “turkeys, ham, and all the trimmings,” but in a less-than-traditional setting. “Greater Phoenix Mensa annually hosts a regional gathering for Mensans and their guests, which kicks off with a massive Thanksgiving potluck dinner and continues through the weekend,” Morris said. He is chair of this year’s potluck for the group, a “society of bright people” that “welcomes people from every walk of life whose IQ is in the top 2 percent of the population,” according to its website. But for Arizona resident Diana Brandt, the holiday leans toward Rockwell’s image of it. For many, trying to reach that idealized version of the holiday is a tradition in itself. 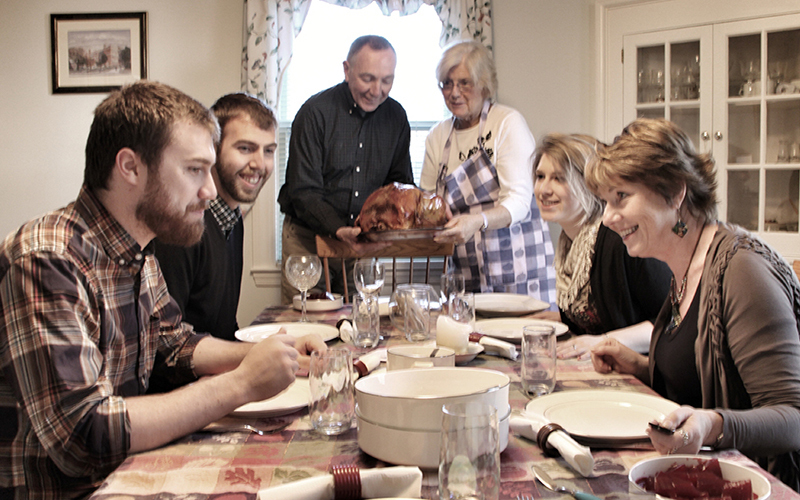 Gifford, who teaches at George Mason University, said “family dysfunction is the centerpiece” of the modern Thanksgiving, with efforts to create that traditional holiday now the fodder for situation comedies. And traditional fixings still rule: American farmers will produce 228 million turkeys and 8.41 million barrels of cranberries this year, according to the Department of Agriculture. But turkeys and cranberry sauce are no longer required for the holiday, which “is really anchored in family and personal experience,” said Jessica Carbone, who works on the Smithsonian Institution’s American Food History Project. What has not changed is that many Americans will continue striving each year to create that perfect Rockwell holiday, Gifford said. EDITOR’S NOTE: Sources in the Public Insight Network informed the reporting in this story through a partnership with the Cronkite PIN Bureau. To learn more, or share your story, click here.